Fuzzing is an automated method for detecting bugs in software that works by feeding unexpected inputs to a target program. It is effective at finding memory corruption bugs, which often have serious security implications. Manually finding these issues is both difficult and time consuming, and bugs often slip through despite rigorous code review practices. For software projects written in an unsafe language such as C or C++, fuzzing is a crucial part of ensuring their security and stability. In order for fuzzing to be truly effective, it must be continuous, done at scale, and integrated into the development process of a software project. To provide these features for Chrome, we wrote ClusterFuzz, a fuzzing infrastructure running on over 25,000 cores. Two years ago, we began offering ClusterFuzz as a free service to open source projects through OSS-Fuzz. Today, we’re announcing that ClusterFuzz is now open source and available for anyone to use. We developed ClusterFuzz over eight years to fit seamlessly into developer workflows, and to make it dead simple to find bugs and get them fixed. 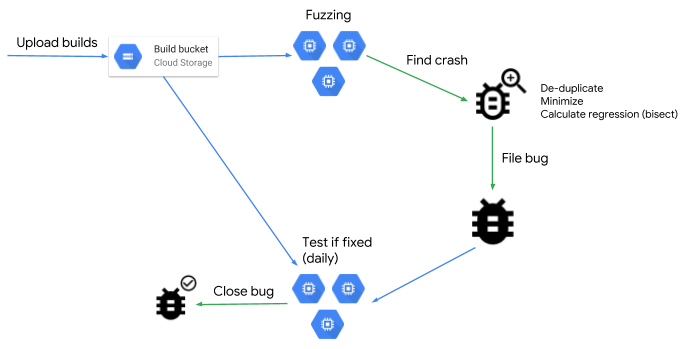 ClusterFuzz provides end-to-end automation, from bug detection, to triage (accurate deduplication, bisection), to bug reporting, and finally to automatic closure of bug reports. ClusterFuzz has found more than 16,000 bugs in Chrome and more than 11,000 bugs in over 160 open source projects integrated with OSS-Fuzz. It is an integral part of the development process of Chrome and many other open source projects. ClusterFuzz is often able to detect bugs hours after they are introduced and verify the fix within a day. Check out our GitHub repository. You can try ClusterFuzz locally by following these instructions. In production, ClusterFuzz depends on some key Google Cloud Platform services, but you can use your own compute cluster. We welcome your contributions and look forward to any suggestions to help improve and extend this infrastructure. Through open sourcing ClusterFuzz, we hope to encourage all software developers to integrate fuzzing into their workflows. This entry was posted in Online Security Blog and tagged Security on February 7, 2019 by Aaron Stein.